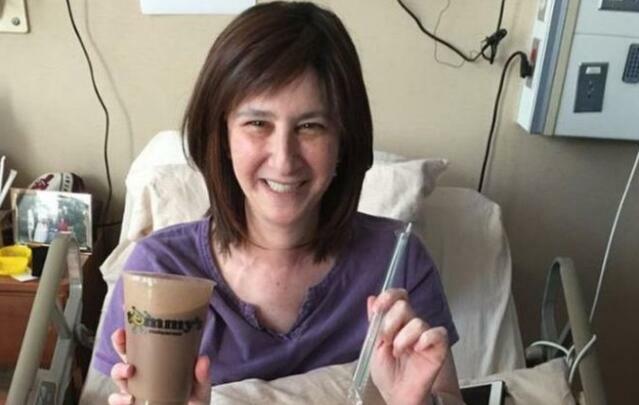 An Ohio restaurant has made a dying woman's bittersweet last wish come true, by shipping a milkshake to her deathbed across the US. She told her friend, Sam Klein, and he contacted Tommy's in Cleveland Heights to arrange the long-distance order. "She said with a smile, 'I wish I could have one more Tommy's mocha milkshake,'" Mr Klein said. "A few days later I got a call from Tommy Fello, the owner of Tommy's. 'Yes. We will figure out a way to do this,' is what he said," Mr Klein said in a Facebook post. Mr Fello told Cleveland's Fox 8 News that he had never dealt with an order like this one in the restaurant's 47-year history. "I wasn't even sure if we'd be able to do it," he said, adding that those involved had dubbed it the milkshake mission. Mr Klein said Ms Pomeranz, 50, was overjoyed to taste her favourite shake. "I know Emily would love the fact that she's making people feel good even though she's not here with us anymore," Mr Klein said.